Markus Dravs clutches his MPG and Brit Awards. The 2011 Brit Awards may not be taking place until tonight, but the top British Producer has already been named as Markus Dravs. As helmsman on Mumford & Sons Sigh No More and co-producer on Arcade Fire's Grammy-winning The Suburbs, few would deny that he had a pretty successful 2010. Dravs was presented with his prize by Chris Martin at last week's Music Producers Guild Awards (the MPG's Best Producer also becomes the Brit Award winner). He's currently working with Martin and the rest of Coldplay on their new album. 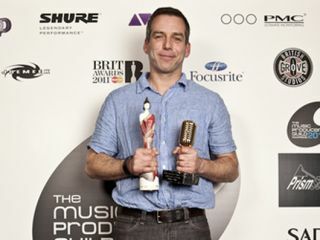 Other winners at the MPG Awards included Guy Massey (Recording Engineer of The The Year), Mark 'Spike' Stent (Mix Engineer of The Year), Tim Young (Mastering Engineer of The Year), and Daniel Lanois (International Producer of The Year). The Coral's Butterfly House was named UK Album of The Year, and Plan B's She Said took home the UK Single of The Year prize. Awards also went to Eliot James (Breakthrough Producer of The Year), James Rutledge (Re-mixer of The Year) and Jake Jackson (Breakthrough Engineer of The Year).